» A Movie Review by Walter Albert: THE LADY (1925). 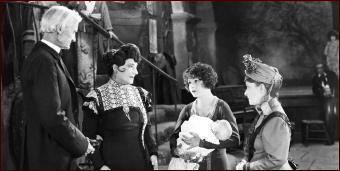 A Movie Review by Walter Albert: THE LADY (1925). THE LADY. Norma Talmadge Film Corp., 1925. Norma Talmadge, Wallace MacDonald, Brandon Hurst, Alf Goulding, Doris Lloyd, Marc McDermott, Paulette Duval. Screenplay by Frances Marion. Director: Frank Borzage, director. Shown at Cinefest 28, Syracuse NY, March 2008. Polly Pearl (Norma Talmadge) marries the dissolute son (Wallace MacDonald) of a British aristocrat. The father disinherits his son who gambles away what remains of his money in Monte Carlo and dies, leaving Polly with an infant son. She is singing in a Marseilles dive when her father-in-law turns up with his lawyer and attempts to take custody of the child. Polly entrusts the child to a British couple (a curate and his wife) and then spends years looking for him. Their reunion leads to momentary tragedy but the possibility of an eventual happier resolution. Norma Talmadge shines as the unfortunate Polly and the gifted director handles the unpromising materials with consummate skill, spinning cinematic gold out of straw. May I confess that I’ve never seen a Norma Talmadge film? She only made 160 of them, all but two of them silents, like THE LADY. Is this one I should start with, if I can find a copy, or might I be better off with another? I’ve not seen either of her sound films and have seen just a handful of her silents. There was a Talmadge DVD set issued within the last year (possibly by Kino, but I’m not certain of this) that included films of two of the Talmadge sisters, Constance and Norma. I’ve reviewed the films I’ve seen but since I have no index to my reviews I can’t give you any more information or make a recommendation to you at this time. Maybe an index is a project I should do sooner rather than later. I’m in exactly the same boat. I’ve written reviews for maybe 90% of the books I’ve read over the past 40 years, but it’s still hit-or-miss which of them show up as I go hunting through my notes or old fanzines. I’ll check out the Talmadge DVD set you mentioned. Someone who was as popular as she was, even though for a relatively short period of time, ought not to be forgotten. No contents listed on Amazon. Both sets released in June 2010. Released by Kino in March. I may start with this one.